Troy University prides itself on multiculturalism and an international student body. Accordingly, its International Arts Center strives to exhibit works of art that bridge the gap between East and West. 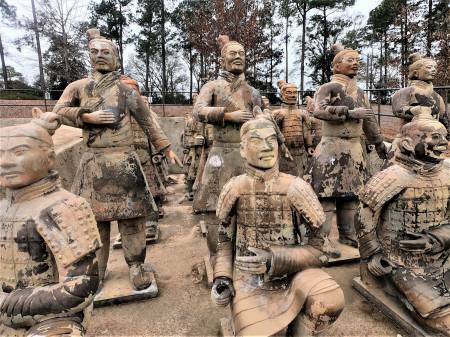 The crowning achievement is an outdoor display of 200 terracotta figures by sculptor Huo Bao Zhu, replicating some of the 8000 figures buried in a Chinese emperor's tomb more than 2200 years ago. The figures, representing various types of soldiers, are painstakingly detailed and posed to resemble the originals. They are part of the Janice Hawkins Cultural Arts Park featuring other pieces of sculpture and an amphitheater. Inside the Arts Center museum is an exhibit giving the background of the tomb and the project of duplicating these soldiers. The museum is open daily during daytime hours, except for major holidays. The Cultural Arts Park, featuring the terracotta figures, is open around the clock. Both are free. Guided tours are available. The museum also features artwork by Rembrandt and Dali among others. I took my two grandsons to this traveling exhibit a few years ago in San Diego. The figures themselves are truly remarkable, each one unique rather than mass-produced. What really made it special for the boys was that there was someone in a full-sized replica outfit roaming the exhibit who came up from behind and tapped them on the shoulder. No dialogue was exchanged, but it made the visit incredibly memorable. I hope they're still doing that. Didn't see that this time, but that does sound fun. Yes, the figures truly are impressive -- they look as if they've actually been excavated from a centuries-old tomb.